Small town South Africa decoded by author Julienne du Toit. Chris Barr is one of many semigrants or incomers who have launched projects to uplift their new hometowns. Part of it seems to be because dorps operate on a smaller, more human scale. Moving to the Platteland – Life in Small Town South Africa by Julienne du Toit and Chris Marais wins big at the 2018 Richmond Boekbedonnerd literary festival. Swapping Johannesburg for Cradock was one of the best moves we ever made. Here are some of the reasons why. Who Wants to be a Travel Writer? Karoo Space team joins the SA Writing College as travel writing tutors. 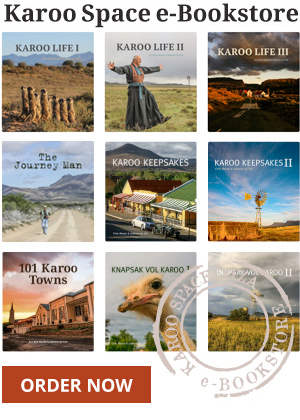 Karoo Keepsakes, Karoo Keepsakes II and Road Tripper – Eastern Cape Karoo are great reads, wonderful gifts and excellent inspirations for a life-changing road trip through South Africa’s heartland. Unusual and exciting roadside attractions to discover on your next trip to the Eastern Cape Karoo.